Memorial Day, or Decoration Day as it was originally called, is dedicated to remembering those who have given their last full measure. It began to honor those who died in the War Between the States, with both sides laying claim to its inception. After WWI, “The War to End All Wars,” Memorial Day was expanded to include all those who have died in the service of their Country. Last Thursday, as they do every year, the 3rd U.S. Infantry conducted the “Flags In” ceremony placing small American flags on the graves of those buried in Arlington Cemetery, including my father’s, and will walk post for 24 hours a day through the weekend to ensure that each remains standing. 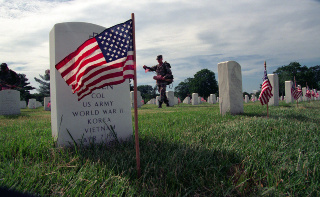 It is the only day of the year that flags are permitted to be displayed on every grave. The “National Moment of Remembrance” resolution (passed on Dec 2000) asks all Americans “To voluntarily and informally observe in their own way a Moment of remembrance and respect, pausing from whatever they are doing for a moment of silence or listening to ‘Taps’ ” at 3 p.m. local time on Memorial Day. “In Flanders Fields”, published during WWI, is perhaps the most eloquent elegy to the fallen of all wars. It is the poem that inspired the making and wearing of the paper poppies that were first sold to benefit servicemen in need and later to support war orphaned children and widows in France. Monday, I will take a moment to gaze at my flag and say a silent “thank you” to the soldiers, sailors and Marines who volunteered to serve so that I have never had to. This entry was posted in Cultivating and tagged history, soapbox. Bookmark the permalink. Lovely post, C, and a wonderful tribute to your father. Happy Memorial Day. We went to visit my father’s grave on Friday. It’s been a year now, and his stone has just placed. I might post pix of the church, since it’s a lovely historic country church. our posts were along the same, flag-post today. 1/2 mast til noon. out to lower mine til 12. Fairfax, I think that would be a very moving and cathartic tribute.